Product #21026 | SKU SWC88HCL6-C BAND | 0.0 (no ratings yet) Thanks for your rating! The CR88 receiver’s front panel provides a Select button for auto syncing receiver and transmitter channels via an infrared signal. The panel also features a 7-segment Channel LED, Volume knob, Power button, two tuned antennas, as well as Audio and Ready indicators, for optimal functionality and monitoring. Balanced XLR and 1/4” outputs can be found on the receiver’s back panel. The Concert 88 Handheld features the CH88 Handheld Transmitter with a Q6 Dynamic Microphone capsule. The transmitter, which can operate for up to eight hours on two AA batteries, is engineered to the finest detail to provide the ultimate in sound reproduction. 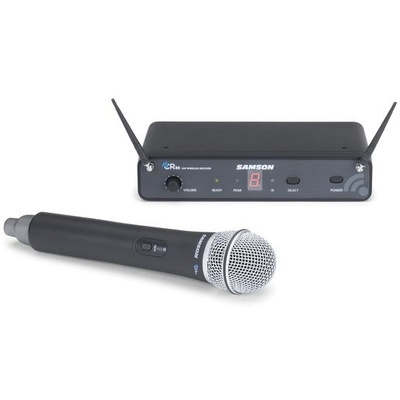 With Samson’s Concert 88 Handheld Wireless System, advanced technology and total versatility combine to provide high-quality wireless performance wherever singers, business professionals, educators and others need it.